What exactly is the definition of Enterprise SEO? The truth is it’s a lot more simple than people might think. We wrote a detailed piece about it a while back, you can find that here. Basically, if your site has a thousand Pages or more it’s an Enterprise site which may come as a surprise to some people. If you have a big e-commerce site, it’s probably an enterprise site. Enterprise SEO is an important action item for large companies. According to Search Engine Land it is much closer to Supply Chain management than it is to marketing. Anyone who is considering investing in Enterprise SEO should do some serious research before diving in. Understand that it’s a process that takes a long time to show results! SEO on the whole is more of a long play. Similar to the stock market in the sense that it has ups and downs in the short term but in the long term it’s always going up. Yes Enterprise SEO is similar to buying blue chip stocks on the NASDAQ. The logic is simple: once you complete an Enterprise SEO job, you then have thousands of SEO’ed pages sitting out there on the web creating visibility for your brand in search results and generating real user traffic. If you’re a company that plans on being around for a while, the investment is worth it. We have clients that we have worked with us for over a year on massive initiatives. The amount of time spent typically depends on the scope and budget behind a given project. The first thing to do is your research. If you are a company that is looking at Enterprise SEO read about it! Ask questions and make an informed decision because it’s a large investment and it’s something that’s going to take a lot of time. Do your due diligence and you find a company or agency or group of people or a or a candidate that you are confident is going to do it right the first time. Full-Time In House or Agency? One of the biggest decisions you have to make is between hiring in-house or using an external agency / consultant. In a lot of cases this really depends on your company’s budget and how deep you plan on going. If you’re a company that already has a website with a hundred thousand plus pages and are hiring people to make a hundred thousand more it may be worth it for you to hire a team in house. With that level of staff you should have the budget for it. Get a full team to help manage this process internally because it will be massive. On the other hand sometimes agencies do a better job because they have the experience and resources necessary to do huge amounts of labor at a cheaper cost with less mistakes. Keep in mind also that if you hire a team of 5 to 10 employees there are additional hidden costs such as health care benefits and time off. This is an important first choice to make but be sure to consider all internal factors within your company. Where does your budget for Enterprise SEO come from? Most would think it comes from the marketing department but some companies will count anything work-related as an IT expense. Since modern SEO is mostly about content it could also be editorial. In most cases your SEO team is going to need to make edits to your website. Depending on the type of company you are there is likely already someone being paid to edit the site. 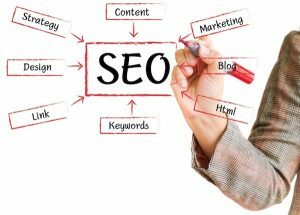 So you need to make sure that your SEO team can work with them to get the changes they need made, made quickly. The goal of Enterprise SEO is to manage the yield of every web facing activity to account for its search. That effect and the cumulative yield of this chain should outperform your competitors over time. It’s a process that aggregates winners slowly but once you have visible momentum you have a defensible and strategic advantage over your competition. If you’re a large eCommerce site you’re going to have a huge amount of product pages. The SEO value of these pages alone may create all the lift you need. On the other hand, if you’re implementing a content strategy, make sure you think long and hard about the content creation process. What kind of useful content can you create around your brand that Google is going to elevate most? Whatever the case content is extremely important and anything you can do to develop unique content is going to give you an edge over your competitors. If you have a massive website, the sooner you get started with a serious and focused enterprise SEO plan the better. Contact us today for a comprehensive audit on your website and a detailed quote on how we will approach your project.